Besides having over 20 publications and 30 years of clinical experience, Maj. Gen. Dr. Azhar Mahmood Kayani has the privilege of being the personal physician to the President and the Prime Minister of Islamic Republic of Pakistan. He is currently the Executive Director, Rawalpindi Institute of Cardiology. Dr. Azhar Mahmood Kayani graduated from King Edwards Medical College, Lahore in 1979 and joined Army Medical Corps in 1980. In 1989, he qualified MRCP (UK) from London. 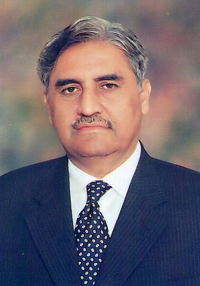 He was then appointed as consultant Interventional Cardiologist at Armed Forces Institute of Cardiology and subsequently served at Combined Military Hospital, Multan, where he established a cardiac center in September, 1991. Adding to his remarkable performance, he has the prestige of being the President of Pakistan Cardiac Society and Senior Consultant Interventional Cardiologist at AFIC. He is also the Director General of Medicine, and Advisor in Cardiology at Pakistan Armed Forces. He is a member of more than a dozen professional organizations and a member of editorial board of Pakistan Journal of Cardiology. He has also been serving as temporary advisor to the World Health Organization on cardiovascular diseases for 5 years. Science Bee – Bringing out the Science in You! Pakistan is proud to have people like him .Asset of Nation.I also request respected scientist to share time with nust students.Give them inspiration to develop.I am a medical Doctor mother of a student of nust. Thank you very much for your kind words. I would love to spend more time and interact with students from NUST. I agree with the comments of Madam Rubina Shaffiq General Sahib is really an asset for this nation. I am his painted since last 4 years he is really very experienced person in cardiac diseases. A real kind person is Gen. saab i have ever seen. We proud of u sir………!! !